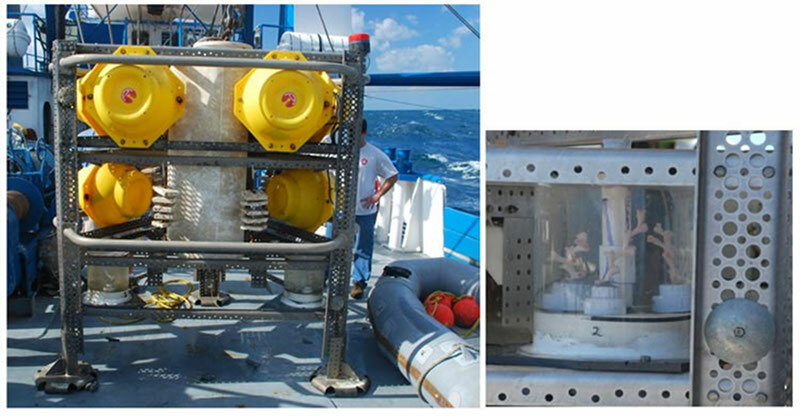 USGS sediment trap and streaming floats are being deployed off the stern of the NOAA Ship Nancy Foster. Image courtesy of E. Hanneman, Deepwater Canyons 2012 Expedition, NOAA-OER/BOEM/USGS. Download image (2.6 MB). This will be the final cruise in our four-year project to study submarine canyons along the continental slope of the Middle Atlantic coast. Submarine canyons are dominant features of the outer continental shelf and slope of the U.S. east coast from Cape Hatteras to the Gulf of Maine. Linking the shelf to the deep sea, these conduits funnel anthropogenic pollutants, organic carbon, and sediments from shallow to deeper waters. 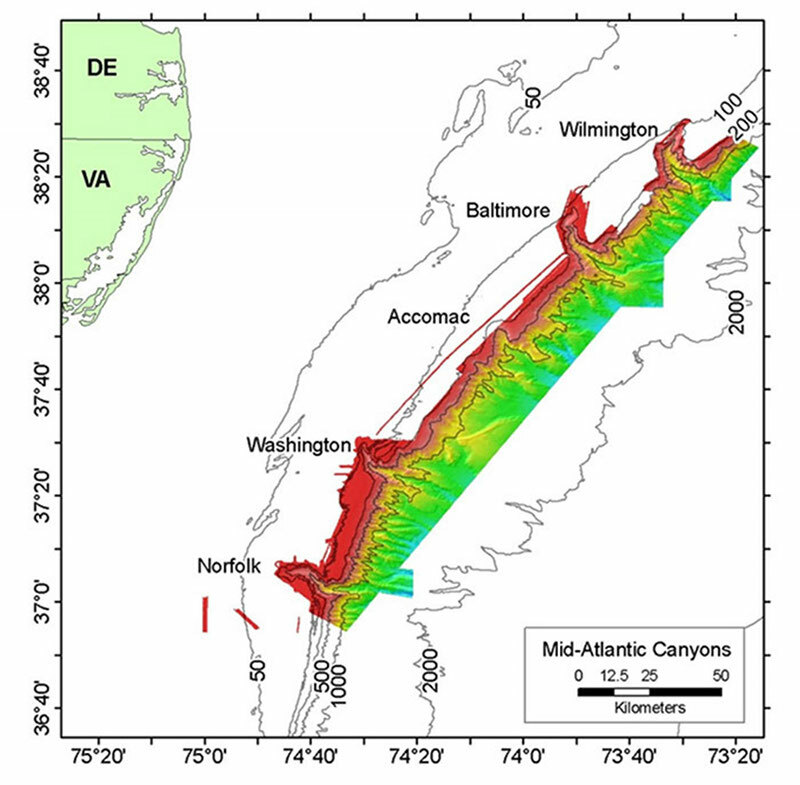 This map shows major middle Atlantic canyons; the emphasis of this study is on Norfolk and Baltimore Canyons. Multibeam sonar data are represented by color shaded areas. Image courtesy of Mike Rhode (UNCW). Download image (jpg, 95 KB). Our work has focused on Baltimore and Norfolk canyons and their surroundings and has included surveys of deep-sea coral habitats, new methane seep communities, sandy/muddy seafloor, rugged canyon walls, and a variety of shipwrecks. This cruise mostly involves retrieving oceanographic instruments left on the seafloor in 2012 that we will use to collect precise time-series data on environmental variability that is typically unattainable. The cruise will use NOAA Ship Nancy Foster and will originate from and return to Charleston, South Carolina. Institutions participating in this cruise include: NOAA’s Office of Ocean Exploration and Research, Bureau of Ocean Energy Management (BOEM), United States Geological Survey (USGS), CSA Ocean Sciences, Inc., University North Carolina-Wilmington, Florida State University, North Carolina Museum of Natural Sciences, ArtWork, Inc., Netherlands Institute for Sea Research, and Cape Fear Community College. University of North Carolina-Wilmington benthic lander. 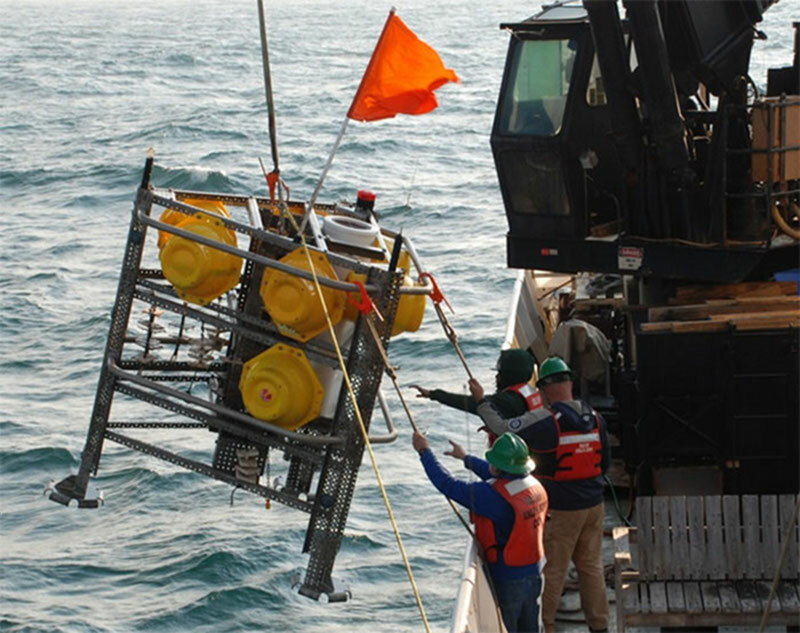 Two UNCW landers were deployed in Baltimore Canyon and two similar landers belonging to the Netherlands Institute for Sea Research were deployed in Norfolk Canyon. A USGS mooring was also deployed in each canyon. These landers and moorings provide a way to collect precise time-series data on environmental variability that is typically unattainable. Image courtesy of Steve W. Ross (UNCW). Download image (jpg, 126 KB). The primary task will be to recover two benthic landers and one mooring in Norfolk Canyon and the same amount and type of gear from Baltimore Canyon. The benthic landers consist of a triangular aluminum frame surrounded by enough glass ball floats (in yellow plastic housings) to keep the lander on the surface. The landers are weighted with a large steel cylinder to keep them on the bottom. Each lander contains a programmable sediment trap which can take 12 monthly samples, plus instruments to record temperature, salinity, dissolved oxygen, turbidity, and bottom currents every 15 minutes. Each lander also holds settling plates that will allow us to examine recruitment of larval invertebrates. The USGS Honjo Mooring is a sub-surface mooring, so characterized by its lack of surface expression. 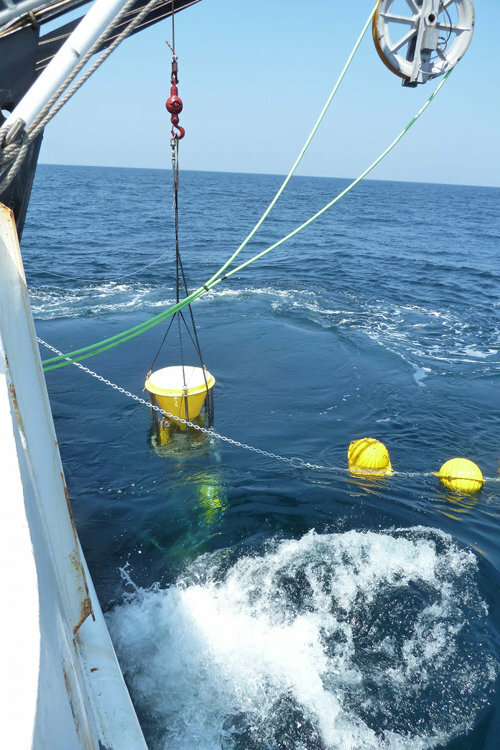 Building from the ocean floor up, the mooring consists of an anchor connected by chain to a Parflux Mark-7 Sediment Trap (collects settling particulate matter monthly into separate sample bottles) at 4 meters above bottom (mab). Above the trap at 9 mab is a Sea Bird Conductivity Temperature recorder (Microcat) and attached directly above that is an upward looking Acoustic Doppler Current Profiler (ADCP) at 10 mab. The rest of the mooring consists of 18 glass balls used for deepwater buoyancy, rising up to a total height above bottom of 43 meters. These balls not only hold the entire mooring upright in the water column, but will provide the necessary flotation for recovery. Recovery is accomplished via acoustic releases that basically let go of the anchor. A University of North Carolina-Wilmington lander after one year on the bottom in 400 meters (left). Image courtesy of Steve W. Ross (UNCW) and Sandra Brooke (FSU). Download image (jpg, 96 KB). These landers and moorings will deliver a huge, complex year-long data set that will allow us to document environmental variability experienced by the animals we observe with the remotely operated vehicles. Recovering these instruments will occupy most of our daylight activities. Work days will span 24-hour operations and the remaining work at these sites (mostly at night) will be to accomplish CTD casts at single stations and along several transects in each canyon. Several targets of archaeological interest will be mapped with multibeam sonar as time allows. Several educators and students will accompany the cruise, and they plan to send back to shore regular updates on our activities.